Why do wooly buggers work? There are several answers with two being the short over arching responses. The most obvious is that the wooly bugger imitates baitfish/stoneflies/hellgrammites/leeches, etcetera. The less obvious pertains more specifically to stocked fish. They eat the wooly bugger because they don’t k now what it is, and the only way they can investigate it is to bite it. Either way there is a time and place for wooly buggers and often when nothing else works I can put on a wooly bugger and light fish up. For those interested in the reasons they work so well Ill explain below. The first reason the fish are so interested in buggers is that in any color they move through the water in the many ways baitfish do. You can’t fish them wrong. Dead drift, strip fast, strip long and slow, swing, dangle downstream, you cant fish them wrong as long as they are in the water. In addition to minnows when you dead drift them they look like all the insects mentioned above provided the size and color matches what the fish are seeing. The second reason they work so well is that stocked fish fresh from the hatchery tanks have never seen something moving above them and through curiosity can’t stay away from a wooly bugger swinging overt their head. They have no hands right? So biting the fly is the only way to learn more about it. By the time they figure it out its too late. You got them. Once stocked fish have been in the river for a while they develop a form of PTSD and learned form of distrust of all things dead drifted. They get pounded by all flies and get to appoint where they have seen fewer things swung than dead drifted. Nothing swings better than a wooly bugger. Im not saying the wooly bugger is the best fly by any means. If you fish it exclusively you will catch fish and some days you will catch the most. My point is I always have a few in olive, black, and white in my box and make sure to to try them at some point during the day. Especially as a day saver type fly when nothing else seems to work. If you don’t have some order a couple in each color here. Tie them on with some 3x tippet and let them rip. Brown Trout Fly Fishing Guide JEREMY EDGE Wins the 3 Rivers Carp Cup!! July 30 marked this year’s annual Carp Cup in Knoxville, TN, hosted by 3 Rivers Angler. If you have ever been to any kind of fishing tournament in your life, this one is a one of a kind experience. Allen Gillespie puts this event on with the help of Outdoor Knoxille as a benefit for the Legacy Parks Foundation, and it always draws a pretty fun crowd! This year’s event was my third carp cup. I won the 2014 Individual class, came up short in 2015 and had a good feeling about 2016. Check-in started 8am and due to weather rolling in I showed up, got my carp cup ruler and rolled out to the French Broad. Just outside of Knoxville is the Douglas and Cherokee Reservoir. Below Douglas is the French Broad and below Cherokee is the Holston River; both being tail waters they offer a very rich ecosystem for fish to thrive in, and with reasonable flows can offer top notch sight fishing to multiple species such as small mouth, carp, gar, and drum. I had fished the FB in weeks past and knew what I had to do and where to hopefully find fish. I wasn’t on the water twenty minutes before I had my first carp and I was off and rolling…or so I thought. In my experience, if you catch a nice fish within the first hour, it’s usually the kiss of death, and this time it took shape in the form of a rain storm. The storm rolled on for about an hour as I laid up under a tree in my kayak trying to stay as dry as I could, watching fish tails pop out of the water every now and then. When the heavens parted and the rain stopped, it provided that “Good God it’s Hot!” type humidity for a few hours, then the fish began to move and eat. that afternoon. After a day of paddling, fishing, cursing, laughing, more cursing, and five carp, I called it a day and rolled back to Outdoor Knoxville Adventure Center for weigh-in at 6pm. The tournament is judged on the five largest carp a team/solo can catch with 1 in = 1 point, and whoever has the most points wins their division. Anglers rolled in over the next hour and I always love the fish stories, horror stories, and Cinderella stories that come with it. The award ceremony started at 7 pm and I wasn’t sure how I fared against the competition, but felt I had a good shot. After all was said and done, I won the Individual/Kayak class with five fish totaling 122 inches. Prizes were awesome, good times were had by all and I thank all the sponsors that helped put this event on. 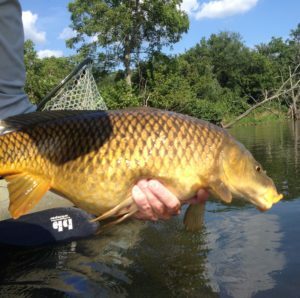 If you’re looking for something fishy to do come next July, I highly recommend driving yourself to Knoxville, TN, and come check out the best carp fishing in the southeast. Thanks again to 3 Rivers Angler, Outdoor Knoxville, and all the Knoxville anglers for making this an awesome event. Each angler receives a ½ day guided float trip, plus a ½ day unguided wade fishing excursion accompanied by ORVIS Fishing Manger or Brown Trout representative. Lunch and Drinks included. boots – boots with studs can’t be worn in boats but are great in the river. Felt is fine both places. If yo have studs have soem kind of alternate footwear for the boat. Our Partners at ORVIS Asheville area offering their FREE fly tying 101 program again every Saturday from January 16 – February 27 9am – 11am. Come to learn the tools, techniques and steps for tying a few patterns that are our favorite for catching North Carolina trout. Click the link below to visit their page and sign up online. You can also call them 828-687-0301 for details. The Upper Section – runs from the Dam to Hunter Bridge. The first half of the river is mostly on private land and is very gorge like. Huge limestone cliffs dominate the sides of the river until the river gets down to Siam. From Siam to Hunter the river is mostly large shallow riffles with deep slow pools between them. The bug life up here is mostly midges, small mayflies, and scuds. Midges hatch year round and BWOs hatch most commonly from Oct-April. This section is the most likely to stay clear if we see big rains. The upper has the highest fish numbers on the whole river. The Middle Section – runs from Hunter Bridge to the TWRA access at Blevins Rd. The first half of this stretch has many shallow riffles and smaller runs. 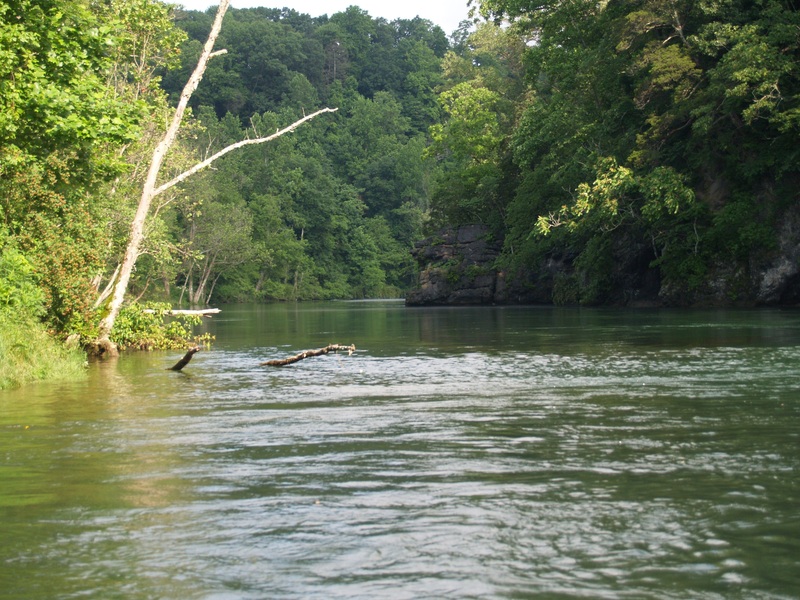 Once you pass through Elizabethton the river narrows and gets deeper. There are many big ledges separating slow deep pools and even one small waterfall that must be navigated by boat operators. Bugs here are larger than the upper, but many midges are still found along with bwos, sulphurs, caddis, and craneflies. As you move through the middle fish numbers decrease slightly, but average size goes up. The Trophy Section – runs from Blevins rd to Persinger Bridge in the town of Watauga, TN. This is the stretch of river that receives the most angling pressure, but it has the largest concentration of big fish. Special regulations forbid the use of bait or scented artificial and anglers can only keep two fish per day of at least 14” in length. 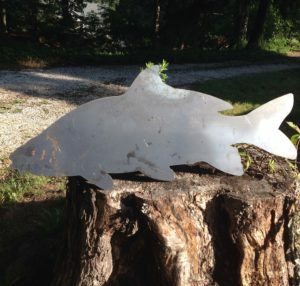 This allows many more fish to grow to larger sizes. Insects here are midges, bwos, sulphurs, many different caddis, craneflies, and assorted other mayflies. There is no public wade access except at the beginning and end of this stretch. The Lower Section – runs from Persinger Bridge into Boone Lake. The most popular take out is at the River Stone Campground and your shuttle driver can arrange for you to use that access. It does require an extra fee. This stretch has some of the coolest riffles on the river and several long flats that are great for picking off feeding fish on dries. Bugs here are the same as the trophy section. The Watauga River flow changes dramatically due to releases from Wilbur Dam. From Memorial Day to Labor Day the TVA has a recreational flow schedule they follow. Basically Monday-Saturday there will be no water until noon or so and then they will generate power and release water for rafters. The TVA usually does not release water on Sundays during the summer. The rest of the year the TVA can generate power whenever they want. Check Wilbur Dam for projected releases and always be ready to get out quickly if an unplanned release occurs. 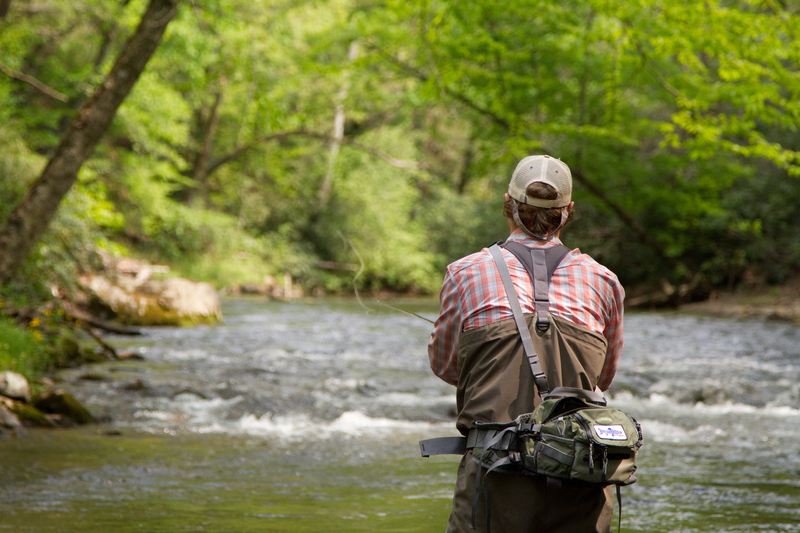 The river is not really wadeable during a water release and you should plan to float it. The Infamous Worm Fly: When should you fish it? The worm fly has led a strained existence. On one side of the spectrum exist dry fly purists won’t fish it and look down their noses at it. In the middle ground are anglers who will fish whatever flies imitate food the trout are currently feeding on at the time. And on the far side are fly anglers who have had great days fishing worms and can’t seem to start the day without one. I reside somewhere in the middle. The reason I fly fish for trout is primarily to solve the puzzle of what are the fish taking now. If trout are eating worms I will tie one on. If they are eating eggs I will fish one of those on too, but that is a different story. I fly fish primarily in the South East for trout and we have lots of rain. When rain falls the ground becomes saturated and worms crawl to the surface because the soil pores no longer have enough oxygen to sustain them. Once the worms emerge the unlucky victims close to water are carried away into the stream flow and trout now have a crazy protein rich food source to gorge on. I have always caught fish on worms during or after rains, but I had never seen a trout eat a natural for obvious reasons (my vision isn’t good enough to see worms under water). This September I was fly fishing Flat Creek in Wyoming with my father in law. It is usually dry fly heaven. The weather was cold and rainy so we couldn’t fish dry flies. We decided to fish streamers since our dries wouldn’t float. My last trout of the day was beautiful 18” cutthroat. As I was removing my streamer from his mouth he vomited enough worms to fill an 8 ounce cup. Point proved. This guy had eaten an entire days worth of food in a few hours. I am really surprised he still wanted to eat my streamer. Rain is not the only time to fish the worm. It is the only time trout are seeing worms in the water column, but this summer on the Watauga River we had two months of super low clear water and little to no insect life. If there is nothing in the water for trout to eat during periods of high metabolic activity I have found they eat random big flies because they are hungry. This summer on a clear hot day when I saw no bug or fish activity I tied on a squirmy worm out of desperation and my modest expectations were shattered. Trout both wild and stocked commenced to chew through my worm collection with a vigor. For a month and a half I experienced a fantastic worm bite. I believe this happened because trout hadn’t seen them since the spring and in the absence of food they ate my flies with insane optimism. Any of us whose fly fishing journey have known since our pond days that fish eat worms. I believe you should fish whatever way you want. I have no agenda, but to help people catch fish. If you want to fish dries exclusively, no problem. More fish will eat the worm for me. 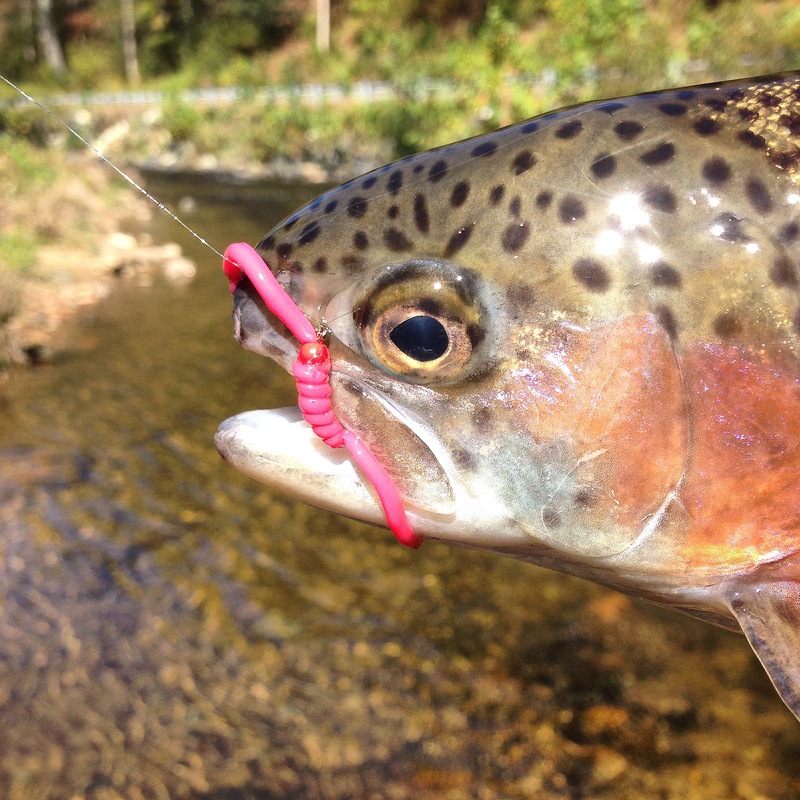 If you are interested in fishing any item on the trout’s list of food items, then throw some worms in your box. They will get eaten! Holiday Gift Certificates: Everything is Included! 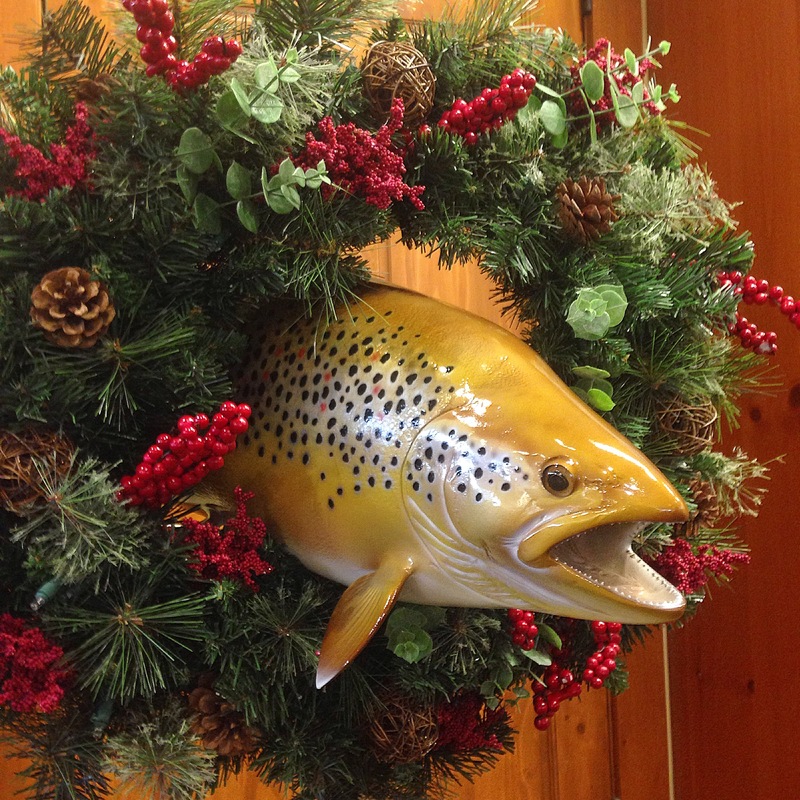 Many non fly fishing spouses or family members want to purchase the perfect fly fishing gift for their trout crazed significant other, but lack the confidence in their own fly fishing knowledge to select the perfect gift. The one thing every angler can use is more time on the water and less time dealing with their own tangles. If you buy a half day or full day guided fly fishing gift certificate from us you don’t have to worry about what gear your angler already has. If they don’t have gear we can provide anything they need free. 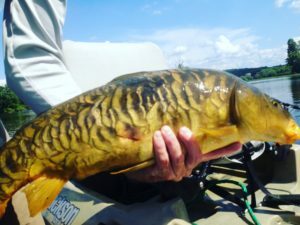 We can always show them a new technique, a new fishing location near Asheville, or simply make their day on the water easier by handling preparation and detangling for them. Just pick a fly fishing trip from either our wade trips page or our float trips page and you can pay by calling us 803-431-9437 or pay two %50 deposits online to be paid in full. We will then email you a gift certificate for the trip you want. As always if you have any questions please email or call and we will be happy to help you figure out which trip might be best. For an additional $20 we will mail you a hat with a printed gift certificate so you have something neat to wrap! All the gift recipient will have to do is call us to schedule their trip. Brown Hobson likes to geek out on fish. The Asheville-based fly fishing guide spent several years managing an Orvis store in Jackson Hole where he fished often, but not often enough. “I wanted to be on the river every day and see how trout react to different things. 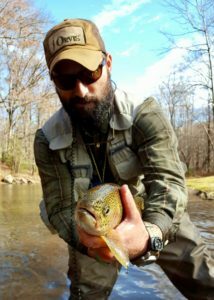 I wanted to nerd out on the trout stuff.” And that’s exactly what he’s been doing since he moved to the Southern Appalachians and started his guide service, Brown Trout Fly Fishing, six years ago. 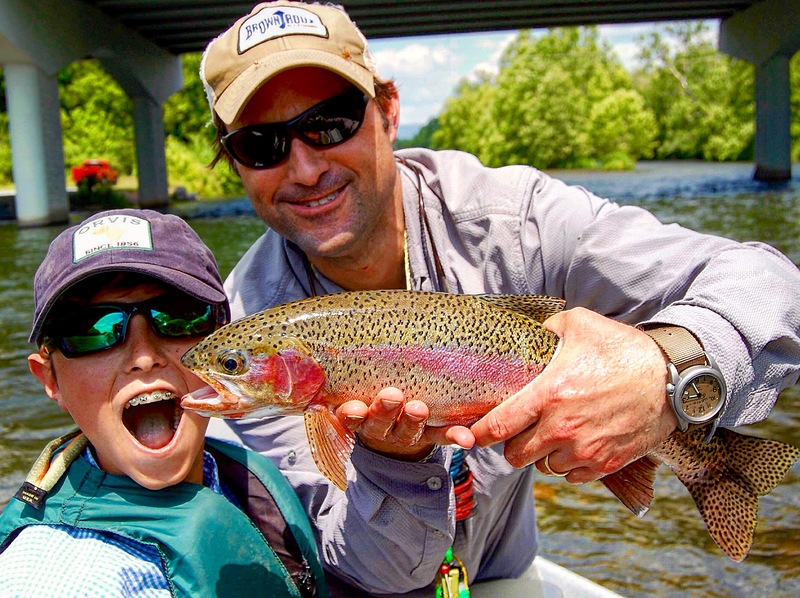 Brown, an Orvis-endorsed guide, is also a member of the U.S. National Fly Fishing Team. We asked Brown to detail his five most essential pieces of gear for fishing small Appalachian streams. Here are his picks, in his own words. Each angler will receive 3-4 hours of guided fly fishing instruction with one other angler and 3-4 hours of unguided fishing in proximity to Brown Trout Fly Fishing Guides. Lunch and Drinks included. Waders, Rods, Flies not included. 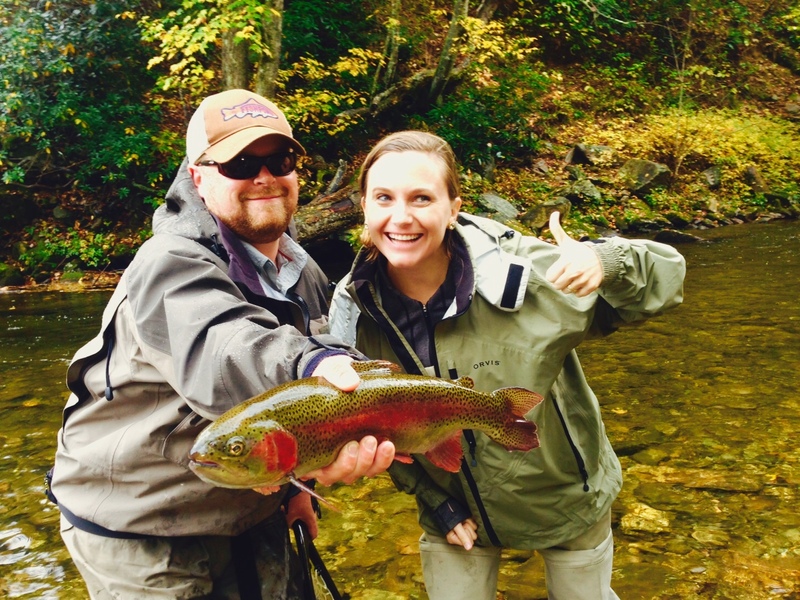 Consult your local ORVIS store fishing manager for appropriate flies and equipment.